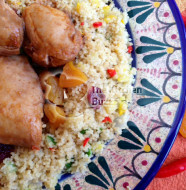 This chicken recipe is from Mexico. It seems impossible to find this dish in a local Mexican (Los Angeles). 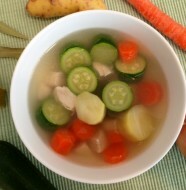 My friend, Lina, introduced the recipe to my husband, Victor. Yes – you guessed it – he’s the one who makes this dish and I get to sit and enjoy it. And so, I decided to try my hand at this recipe and it turned out delicious. You should try it, too! 1. Wash the tomatillos and place them in a 4-quart sauce pot. 2. Bring the tomatillos and the jalapeño or red chili to a boil. 3. Boil the tomatillos and chili for 5 to 8 minutes or until they are soft. 4. Carefully drain the tomatillos, taking care not to let them burst; set aside to cool for 15 minutes. 5. After 15 minutes, transfer the cooked tomatillos to a blender. 6. Remove stem from chili and add the flesh to the tomatillos in blender. 7. Add the garlic and salt to tomatillo-chili mixture in blender; puree the mixture until it is smooth. 1. In a 12-inch skillet, heat the oil. 2. 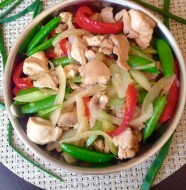 When oil is hot but smokeless, add the chicken chunks; stir fry on medium-high heat for 4 to 5 minutes or until the chicken turns white. 3. Stir in the onion and sauté for 2 minutes or until it becomes translucent. 4. When onion is translucent, pour the reserved tomatillo sauce over the chicken mixture in skillet. 5. Simmer the chicken on medium-low heat for about 25 to 30 minutes or until it is cooked through. 6. Taste and add, if needed, add salt. 7. 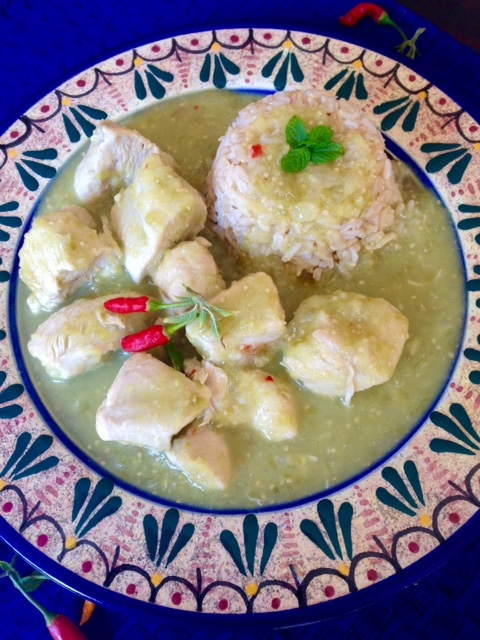 Serve Chicken in Tomatillo Sauce immediately with steamed white or brown rice.